A fantastic ode to a classic Beatles album; but just as awesome even if you didn’t know the music being reinterpreted. Guitar virtuoso, Andy Timmons, wows us with his instrumental interpretation of the Beatles’, Sgt. Peppers Lonely Hearts Club Band album. Timmons, a reverent Beatles fan, certainly made sure he was doing the Fab Four justice with this record. There’s obviously going to be a huge chunk of people that will say, “Remake Beatles music?! Sacrilegious!! !” I myself was guilty of this, since I have a tendency to be a snobbish Beatles purist as times. When I first heard about the effort, I had my doubts that anyone could do the original justice. But for those die-hard fans, fear not! This is a great album and I have to say I was quite impressed, as were all the guitar editors at MusicPlayers.com. Typically, it’s a dangerous thing to tread into, let alone with a power trio. One could argue that Sgt. Peppers was one of the first prog albums ever, with layers of dynamics and one song being a huge departure from the next. With Timmons, it’s a complete reworking of that, with a specific sense of guitar style and sound, backed by a straight-ahead blues rock-based rhythm section… and it rocks. But most importantly, you don’t lose the original essence of the tunes, and at the same time this manages to be a great piece of art on its own. I found myself several times singing along to the music, and despite the lack of vocal content, it isn’t any less communicative. Timmons uses some great overdriven tones as well as light crunch and bright cleans. His skill as a guitarist and arranger really played a part in making the album as dynamic as it is. The warm tone of his Mesa/Boogie Stiletto and Transatlantic amps paired with his signature Ibanez guitar makes the guitar sound huge. He adds just the right amount of dirt when necessary, and softens it just the same. Hence one of the responsibilities of playing guitar in a trio: have great dynamics! Andy has that essential combination of chops, tone, and feel. Just the same, Mitch Marine and Mike Daane are great backup to him on drums and bass, moving the songs along with a nice flow while not detracting from the melodic content of the guitar. They provide just what the music calls for and just like Timmons, they add the “cool stuff” at just the right time, making this trio sound much bigger than the sum of the players. I certainly liked more songs than others. The ones that really stood out to me were “A Day in the Life,” “Fixing a Hole,” “With a Little Help from My Friends,” and “Good Morning Good Morning;” they are almost completely new pieces of music on in Timmons’ hands. In fact, every time I listen to this CD I find more things I like about it; be it a song or just their voicing of a particular section. It definitely takes more than one listen to absorb the album fully. And just like the classic album, repeat listens don’t get boring. And in case you doubt we love the Beatles as much as Andy, yes, we noticed his clever borrowing from the Abbey Road album, “I Want You (She’s So Heavy)” embedded within “Being For the Benefit of Mr. Kite!” Nice touch! If you were already a fan of the Andy Timmons Band from their fantastic record, Resolution, you might have thought that following up that essential guitar record with, basically, a collection of Beatles covers, might not allow room for Timmons to shine and captivate. However, once again, his ability to deliver rhythm and melody from single guitar passages without layers of overdubs is showcased remarkably well. This study in minimalism really showcases the depth of his guitar playing, as you’ll hear through the repeat listens you’re guaranteed to give this CD. This El Camino purrs like a Camaro. Picture this: You’re in a 1974 El Camino, barreling down Route 66 towards the Mexican boarder with the pigs dead on your trail. The adrenaline is pumping. Your foot is so far down on the gas that it feels like your about to transform the mini van into a Flintstones-mobile. You’re not the type that’s cut out for jail; hell you haven’t even done a pushup since high school gym class. There’s no looking back, only full speed ahead. Ok, now back to boring reality and your corner cubicle. You were just experiencing the raw intensity of the Black Keys new album, El Camino. In keeping suit with their previous releases, guitarist, Dan Auerbach and drummer, Patrick Carney turn out another heart pounding fuzzy-blues collection, loaded with enthralling hooks and aggressive attacks on their respective instruments. Coming just over a year after Brothers debuted at #3 on Billboard’s Album Chart, the Black Keys show they have no desire to ease off the pedal. El Camino’s first song and single, Lonely Boy is a high powered, captivating punch in the gut. Opening with a nebulous guitar riff and thumping drums that lead into an infectious hook, this track sets the pace for an entire album that is teeming with foot tapping successes. Along with “Lonely Boy,” “Dead and Gone,” “Money Maker,” “Sister,” and “Run Right Back” are just a few of the other tracks that will leave a lasting impression on your ear buds. Danger Mouse, who produced Tighten Up, the whistling anthem for 2010, stepped in full time for the production of El Camino and his influence is ever so evident on the album. He seems to have a fetish for organs but hell, they sound great combined with the driven rock n’ roll brash of the Black Keys. It creates a vibe that’s comparable to the Doors. The gospel-like gang choirs are another additional boost that gives the album its great vibe and larger feel. The recording is also neat and clean. The howling fuzz on Auerbach’s guitar never stumbles into the mud category of a grunge garage band. The Black Keys provide an answer to those who have been wondering, “Where did rock n’ roll go?” El Camino has that attitude and grit of the Doors with the balls of Jimi Hendrix and just a touch of Queen’s glam, making it a worthwhile record to help you shed the bores of reality. So, hop into that crusty minivan driver’s seat, turn the stereo up to 11, and voyage into the mysteries of the night. Fantastic book addresses all the needs of small studio producers (even the ones you weren't aware of), and is great for all levels of production/engineering skill. 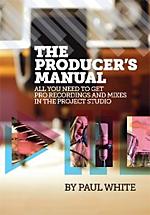 The Producer's Manual tackles music recording and production in the realm of the project (or usually home) studio. Author Paul White (who is editor in chief at Sound on Sound magazine) has written the book in an easy to follow style, and he covers a diverse range of topics, all aimed at helping to provide small studio producers with professional advice useful in today's music industry: a brief history of recording gear; vocal, guitar, piano, drum and band mic and recording techniques; EQ, dynamics and reverb techniques; vocal production techniques (including how to effectively use pitch correction); song arrangement; mix-down; and home mastering. Beautiful, full-color photos are included throughout the book’s entirety, and sections are divided up so that tips and tricks are set apart from the normal text. We found it especially useful that the layout is provided in such a way as to fit two purposes: 1) A straight read; start at the beginning and work your way through to the end. 2) A read-as-you-need guide to keep in the studio and refer to for whatever topic you want a refresher on. Paul's experience shows in the depth and knowledge with which each section is presented, but the fact that his text is so clear and easy to understand is what makes this such a valuable read. Whether he is explaining how to mic a guitar for the most natural sound, or explaining the benefits of parallel compression (and showing how to do it on a computer), he never tires the reader, nor stumbles into long-winded oration. In case you haven't noticed, we highly recommend this book for just about everyone working in a small production or project studio. - Mic recording techniques: a topic that is often a weak point for bedroom producers. Precise measurements and items to keep in mind are given for recording vocals, guitars (both acoustic and electric), keyboard instruments, and drums. - Both traditional and non-traditional uses for basic effects such as compression, EQ, delay and reverb. Not only does he cover basic uses of these effects for begins, Paul also provides tips and tricks for genre-specific uses of these effects. - Vocal production and pitch correction: These are areas which modern producers need to know about, and great information is given. - Production "walkthroughs" that give in-depth tips on how to recreate specific effects/techniques. The book covers a huge variety of production styles. Generally, books like this either cover too much of one specific genre, or not enough (electronic genres such as dance often get left out in the cold in general production books), but Paul has struck a great balance between several different genres. Because of this, we can confidently recommend this book to any type of producer. Everyone will find something useful in here. Our only point of confusion: those darn metric measurements! Considering Paul is based in England and we’re reading this in the US, whose idea was it to use the metric system, anyway? One of the finest rock operas ever written gets a significant sonic overhaul and a bunch of fantastic extras. Kevin Gilbert needs little introduction to the “serious musician” crowd. Besides co-writing much of the breakthrough material for then-girlfriend, Sheryl Crow, Gilbert co-founded the short-lived-yet-revered prog band, Toy Matinee, and produced music for, or wrote and played with, numerous music stars, prior to his unfortunate and very untimely passing away at just 29 years of age. He was easily considered to be another Frank Zappa in the making. The Shaming of the True, Gilbert’s rock opera masterpiece, wasn’t yet completed when he died, but with the cooperation of Gilbert’s family and estate, longtime friend Nick D’Virgilio (of Spock’s Beard fame) completed the album, working from partially-finished demos and notes. Any fan of Zappa-esque progressive rock should consider this album an essential part of their musical vocabulary, a hysterical concept story following the life of a fictional musician named Johnny Virgil, trying to make his way through the shark-infested world of the Hollywood music scene in the ‘80s. We won’t go into a review of the music here because, frankly, the entire album is amazing from start to finish, with outstanding production values and songwriting that span a variety of genres from singer-songwriter acoustic to Floyd-ish progressive to classic rock to funk to orchestral to a capella vocal performance (the awe-inspiring song, “Suit Fugue (Dance of the A&R Men)” of course). This special, limited edition two-disc set is amazing. First, the CD was remastered from the original master analog tapes and sounds even better than the original release. But the bonus second disc contains some real gems: Producer/engineer Mark Hornsby remixed the ballad, “Long Day’s Life,” for which he recorded the London Philharmonic Orchestra at Abbey Road Studios, conducted by John Hinchey, and orchestrated the song. It sounds gorgeous. There’s also a cool, alternate version of the song, “Parade,” and then for a totally trippy mind warp, a spoken word version of the entire record, performed by American “slam poet” and spoken word comedian, Jamie DeWolf. Visit www.kevingilbert.com to get your hands on the limited edition product. For old fans or new, this is killer, killer, killer music. Yes, that’s three killers for you.